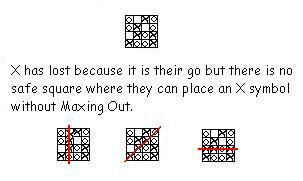 2Max is similar to Naughts and Crosses/Tic Tac Toe but in 2Max you have to avoid getting too many of your symbols in a row. It is a game for 2 players. Players take it in turn to place their symbol (either a naught or a cross) on to a grid. The aim is to place your symbol on a safe square each time so that your opponent is forced to Max out or accidently Maxes out. 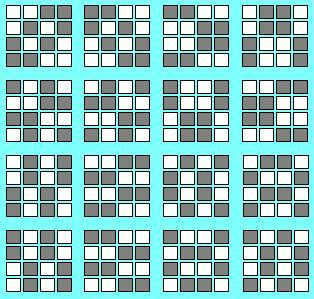 2Max is played on a grid of 4 by 4 squares. In a line of 4, no more than 2 in a row. If you accidentally, or have no choice but to, put a 3rd symbol in a row then you max out and loose the game. If it is your turn to place a symbol but there are no safe squares then you loose the game. If this game was played on a 4x4x4 cube is a draw possible? If so the draw pattern will help find the next prime factor pattern. If the cube configuration is not possible then an 8x8 grid may be the next prime factor pattern in the sequence. Could you help by writing a 3D version of this game or a program that can check the thousands of possible variations? If so or if you have any other questions or suggestions then please contact me. The discerning reader interested in such things as the I Ching, the Kabbalah and Conceptual Science may realize the significance of this work.